RentShare is a Payment Processor that specializes in rent payments (for tenants) and collection (for landlords). The Operate Member Portal is integrated with RentShare, so members can pay invoices and ad hoc payments such as meeting room or desk bookings using RentShare. See here for information about how to set up and configure RentShare in Operate. 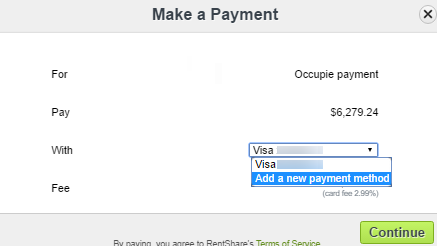 With RentShare, members will be able to add payment information and make payments on the Member Portal. While it is possible for several members to add and manage payment methods under the one Rentshare account, the integration works best if one user manages the payment settings. When the first Admin member under the Account sets up a payment with RentShare, a RentShare Account will automatically be associated with their Operate Account. That member will have their email address associated with the account and it will be used for future use by RentShare. If any other Admin Member makes a payment and also enables recurring payments, then this user will override the first user as the default user associated to Rentshare payments and the email address of this second user is associated with the RentShare Account instead. To make a payment via Rentshare, simply make a meeting room booking or pay for an invoice. We will use an invoice as an example. Get started by logging into your Portal account then going to My Account > Invoicing. Select the Invoice then click Pay. Choose if you want to make a one time or a recurring payment. Click the Pay Now button, found on the left side of your screen. You will now see a Make a Payment Widget. This will show you a payment description (Operate Payment), the amount to pay, the payment method, as well as the fee corresponding to your transaction. Before you can pay, you will need to add a payment method. You can add one or more. The method can be a credit card or bank account. Once you have added your payment method, simply click Continue on the Make a Payment window, then confirm your payment. As soon as your payment is successful, RentShare will confirm it on the screen. To change payment settings, go to the menu under your username and select Payment Settings. Click Manage RentShare Account and you will see a window that allows you to add new payment methods and view existing ones, view your fees and turn AutoPay on or off. AutoPay allows you to make automatic payments on each due date, for the amount due (plus RentShare fees). When setting up a recurring payment, you are able to allocate your own card as the payment method. Please note that the user whose Account is associated with the RentShare account (i.e. the user whose email address is listed under the RentShare Settings) will be able to turn Autopay on and off. Autopay will be overridden if another Admin links their card to autopay because their default card will become the payment method of choice. When viewing the payment settings it is clearly visible which user is currently linked to Autopay - their email address will be listed here. We recommend that only one user manages payment settings within your organization to prevent any issues caused by Rentshare overriding the default payment account. If paying with a bank account it costs a flat $1.95. With a credit card or debit card it will cost 2.99% per transaction. To learn more about RentShare's refund policy, please click Get info on the refund policy, in your transaction confirmation notification; or visit RentShare's Refunds section on their website. To use RentShare, either for making or collecting payments, you will need to agree to their Terms of Service.